Born on November 9th 1906 in Bácsszentivan, Hungary, Kàroly Ney von Pilis was a lawyer by education. 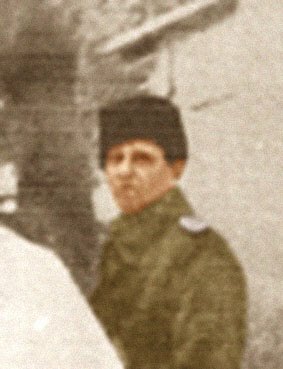 He later joined with the Hungarian army and served as first lieutenant in the Hungarian Gyorshadtest (Schnellen Korps) in Eastern Front during the early phase of Russo-German War. Degraded and dismissed from the Honved army for disobeying order, Ney returned from the Eastern Front in 1943. As a militant fascist and under the influence of Béla vitéz Imrédy de Ómoravicza, a pro-German ex-Hungarian Prime Minister, Ney formed a tightly knit fraternity of anti-communist veteran soldiers, the Keleti Arcvonal Bajtársi Szövetség (Eastern Front Collegiate Federation). He also had ties to Ferenc Szalazi's Arrow Cross Party. A well-connected to veteran Hungarian soldiers and was considered politically reliable, in the summer of 1944 Ney entered the service of the SS and appointed as a Waffen-Obersturmbannführer der SS. Using his organization paramilitary outfit, the Halálfejes Légió (Death Head Legion), Ney mobilized his men into a Waffen-SS unit. At first, the SS plan to use Ney's men to fill out the 22. SS-Freiwilligen-Kavallerie Division ‘Maria Theresia’. But the plan was cancelled after that unit was destroyed in Budapest. Thus Ney's men were formed into a separate SS-Kampfgruppe ‘Ney’. They were attached to the IV. SS-Panzerkorps in January 1945, and used to support that corps in the Konrad offensives that month. Depleted in conventional fighting with the Red Army, the remnant his unit withdrew into Austria and surrendered to the US forces near the Attersee Mountain on 9 May 1945. Ney and five of his men were tried as war criminals by an American military tribunal at Salzburg, Austria. They were indicted for the murders of five captured American fliers by theirs unit on 7 May 1945. Ney sentenced to death by hanging 8 on June 1946. However, his sentence was commuted to life imprisonment in September 1946 after a review. Freeing under an amnesty, Ney later worked as an American agent, organizing clandestine arsenals and sabotage groups in the CIC training centre in Lambach, Austria. Karoly Ney died on September 29th, 1989 in Vienna, Austria.